Typically, dentures become damaged or broken when dropped during the process of being placed in the mouth or cleaned. When dentures fall on hard surfaces, such as a tiled floor or in a ceramic basin, they may fracture or crack. Instead of attempting to fix the denture yourself or going without them, get in touch with us immediately and we will safely and professionally repair your denture. Dentures are often repairable should they incur any damage. However, if severely broken it may not be optimal to repair the denture, but instead provide a new set of dentures for patient comfort. 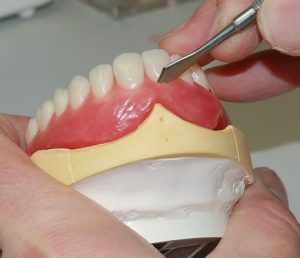 We assess the damage caused to dentures to see if they are repairable. Dentures that are fractured in up to three places may still be repairable, so don’t despair and get in touch with your nearest Malo Smile USA dental office for quality repair solutions. When our dentist recommends denture-repair, the damaged denture is restored by our dental laboratory technician, so that patients may receive their repaired dentures on the same day, usually within one to two hours. Should dentures become stained or discolored from food consumption, beverages or tobacco, it is best to seek professional denture cleaning to ensure that the surface of dentures is not further damaged or dulled. Dentists can professionally clean dentures to preserve their appearance and smooth, glossy surface, so that patients look their best and feel comfort when wearing their dentures. In the event of damage to dentures, do keep the broken denture parts together and do not attempt denture repair at home. Contact Malo Smile USA for an appointment immediately. Bring all damaged denture parts with you to the dental appointment, in order for us to assess the breakage and provide recommendations for repair or replacement.